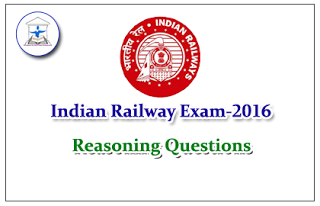 Dear Readers, Here we have given from Reasoning Questions for Railway Exam 2016. Candidates those who are all preparing for these exams can use this material. 1).How many such letters are there in the word TIGER which remain same in its position, if the letters are arranged in ascending order alphabetically ? 2).If each vowel in the word SURROUND is changed to the previous letter of the English alphabet and each consonant is changed to the next letter in the English alphabet, which of the following will be the second from the right end in the new arrangement ? 3).The positions of how many alphabets will remain unchanged if each of the alphabets in the word FORGET is arranged in alphabetical order from left to right ? 4).Three of the following four are alike in a certain way based on the English alphabetical series and so form a group. Which is the one that does not belong to the group ? Directions (Q. Nos. 5 – 8) Study the following arrangement of numbers, letters and symbols carefully and answer the questions given below. 5).Three of the following four are alike in a certain way based on their positions in the above arrangement and so form a group. Which is the one that does not belong to that group ? 6).Which of the following is the fifth to the right of the nineteenth element from the right end ? 7).How many such number are there in the given arrangement, each of which is immediately preceded by a consonant and immediately followed by a symbol ? 8).How many such vowels are there in the given arrangement, each of which is either immediately followed by a symbol or immediately preceded by a symbol ? Directions (Q. No. 9 – 10) Study the following arrangement of numbers, symbols and alphabets carefully and answer the questions that follow. 9).Which of the following is the 3rd to the left of 18th element from the left ? 10).How many such symbols are there in the above arrangement each of which is immediately followed by a digit ? 7). Only one number 5, which is immediately preceded by a consonant and immediately followed by a symbol. 8). Only three vowels E, I and U are in the arrangement immediately followed by a symbol or immediately preceded by a symbol. 10). There are three such symbols (i.e) 7, 3 and @ 4.